Make way for an entirely new style of shaker, featuring a center-mounted spout, a detachable carry loop, odor-resistant materials, and our most secure seal to date. Say 'goodbye' to lumpy protein shakes and 'hello' to smooth, great-tasting drinks. 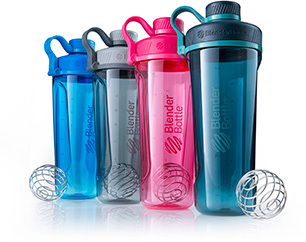 Our patented mixing system uses the BlenderBall® wire whisk—found only in BlenderBottle® brand shaker cups—to mix even the thickest ingredients as you shake. The Radian™ shaker's new flexible carry loop detaches at the base, making it easy to attach keys or clip to a gym bag. 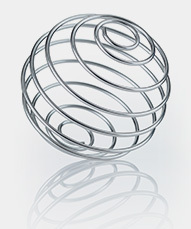 With its tapered base, the Radian shaker fits easily in most car or gym equipment cup holders. Often a feature you don't appreciate until you need it. The unique center-mounted spout seals off with a secure twist cap, delivering an even stronger seal and increased peace of mind.